When Columbus Gold acquired Stevens Basin (where drilling by joint venture partner Navaho Gold is ongoing), it was recognized that the greater Mahogany Hills area, west and southwest of Eureka, Nevada, presented a favorable geologic setting for Carlin-type gold deposits. 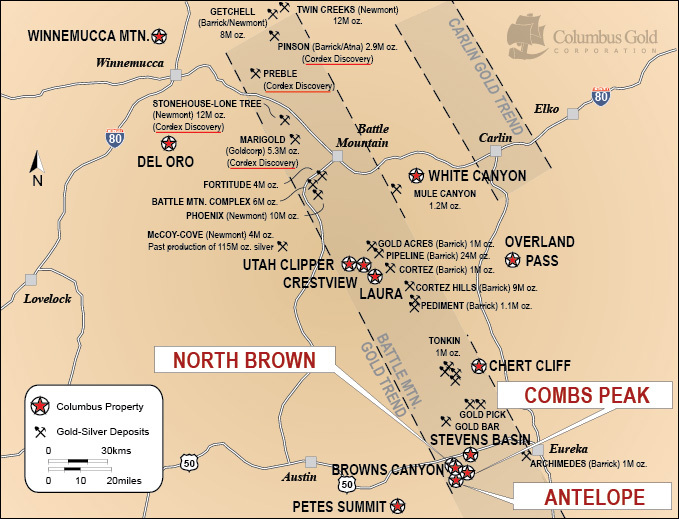 Columbus Gold embarked on a one year sampling program, which led to the recent acquisition of Browns Canyon (see press release dated November 23, 2010) and subsequently these three new acquisitions: Combs Peak, Antelope, and North Brown. Initial sampling at all three projects yielded significant gold assays, with Carlin-type trace element signatures, and all are located in geologic settings amenable to Carlin-type deposits. The Combs Peak Project, ten miles south-southwest of Eureka, Nevada, covers an area of altered Devonian and Mississippian sedimentary rocks, where gold values ranging from nil to 0.4 g/t have been found in the initial sampling of float chips near outcrops of silicified limestone breccia with abundant barite veining. The areas of anomalous float, with no outcrop, are interpreted to lie over Mississippian siltstones, known to be a favorable host rock from Central Nevada gold mines such as Alligator Ridge and Rain. Detailed geologic mapping and grid sampling are planned in the coming months. If the results continue to be positive, drilling would likely take place in 2012. The North Brown Project, twelve miles southwest of Eureka, Nevada, has yielded a number of good grade gold assays (ranging from 2 to 6 g/t Au) in the initial sampling of altered sedimentary rock float.The nearest outcrops are Devonian limestone and Mississippian siltstones with local zones of silicification. Geologic mapping and grid sampling are planned. Drilling is planned following completion of the field program, likely coinciding with drilling at the Browns Canyon Prospect, in the fall of 2011. The Antelope Project, fifteen miles southwest of Eureka, Nevada, yielded values in initial reconnaissance sampling ranging from anomalous to 1.0 g/t Au from outcrops of altered Paleozoic sedimentary rocks. Detailed geologic mapping is in progress and grid sampling is planned for the summer months. The results will be evaluated and, if warranted, a drill program will be planned for 2012. All the mining claims staked on these projects are 100% owned by Columbus Gold, subject to royalties.